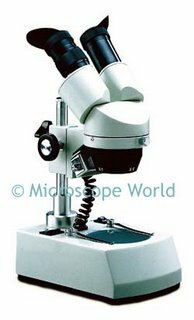 Stereo microscopes generally have two different light paths, which allows you to view your image in 3-D. A stereo microscope also has high depth perception, but lower magnification. The most common uses for a stereo microscope are dissecting, viewing insects, plant-life or any other object you might hold in the palm of your hand, but wish to see more fine details on your specimen. More advanced stereo microscopes will have a light built into the microscope as well as zoom magnification. Zoom magnification allows you to see all magnifications between, say 10x - 40x. 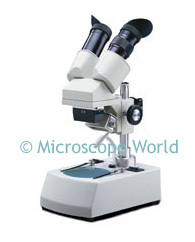 A turret stereo microscope will have fixed magnification such as 10x and 30x only. 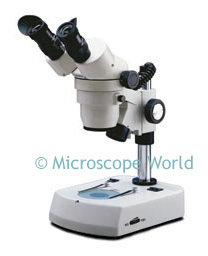 A very basic stereo microscope might only have a single magnification (such as 20x). This type of microscope is great for anyone who knows they only need one magnification and will not need to zoom in on specimens.